Whether you are new to Muay Thai or a regular face at the gym, training mistakes are something which need to be identified, reviewed and worked on in order to improve your journey. Everyone makes mistakes… Even your coach was a beginner at one time. Embracing the mistake and learning from those around you will allow you to develop as a fighter using a strong starting foundation. If you feel mistakes are creeping into your training or something is just not right with your technique development, then check out these top 6 costly Muay Thai training mistakes. Before you carry out any form of exercise, warming up vital muscle groups is key for development. Not readying your body for activity, exercise or training will certainly limit your reaction speeds, your strength, your range of motion, as well as putting yourself at risk of injury. You will not be able to work out or train efficiently if you haven’t warmed up. Training ‘cold’ puts you at risk of poor performance as well as in danger of other ‘warmed’ competitors. Dynamic and static stretching is crucial to warm the body, specifically targeting Muay Thai basic principles and movements to encourage ‘muscle memory’ in certain activities. The benefits of the warm up don’t stop there in this sport. Warming up your muscles, joints and ligaments also helps to warm up your mind. A typical warm up would consist of some skipping, limb rotation and possibly some light punch bag work. Ok, so warming up is crucial. However, the ball is in your court if you want to develop further as a fighter. Flexibility is a key principle of Muay Thai, and this can be worked on inside and outside of training. 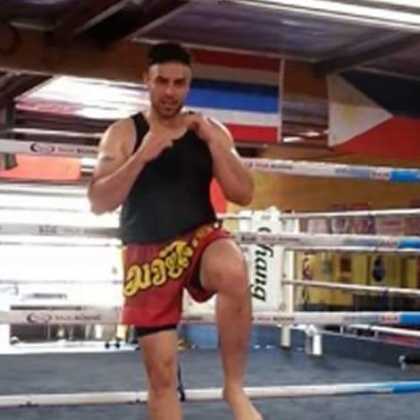 Developing a range of stretching exercises and applying these into your day to day routine will set you in good stead for your next Muay Thai experience. Not stretching on your “days off” will leave you chasing the pack when looking to improve flexibility. Your warm up and cool down should always include stretching, this helps for recovery and growth of your muscles. Furthermore, managing lactic acid build up is an essential part of your cool down, not stretching before, after and in-between training can lead to injury as well as slower development of movements. Turning up to training isn’t enough. Being mentally focused and physically ready to mimic combat experience and competition requirements is what it takes to develop as a fighter. A key mistake many fighters make across a range of gyms is to take training easy. For your body to grow and develop is must react to challenging stimulus otherwise your plateau of performance will last forever. Every training session should challenge you differently from your last. Pushing yourself to reach different limits and different goals every time you step foot in the gym is the only way you can achieve more. Whether you are just training for a bit of fun or fitness, or you have dreams of fighting in Thailand, you need to take it seriously when you step into the gym. Speaking of working hard in the gym, a good coach will do exactly that, challenge you! They are there to work on your set goals and to adapt your training to develop you moving forward, However, a costly mistake many individuals make is to ignore their coach. Years of experience, techniques and learnt mistakes go into their training sessions. To abandon this free advice is a sure fast way of either getting injured or at least stalling as a developing fighter. Not listening to effective technique, commands and demonstrations can be very unsafe, especially in gyms with a range of skills sets and experiences. Not keeping your hands up, especially in training is an opportunity to develop very poor habits. Training is all about forming strong platforms and foundations to work from. Getting the basic principles and techniques right at this stage is crucial for development and will encourage a faster learning curve. The gym is where the formation of good habits occurs, keeping guard both physically and mentally is a habit to be mastered. Regardless of your opponent’s skill set you are in training to master your art, not theirs. Continuing to keep your hands up and keep guard at every opportunity will form strong repetitions that will be harder to break over time. Sparring is not an opportunity to beat each other up – it’s an opportunity to learn and grow. Essentially sparring is done to practice fighting and learn techniques in both attack and defence. Sparring too hard is completely unsafe and a quick way to injury yourself or other members of your gym. Sparring needs to be controlled yet effective. The goal here is not to win, but to practice. Learning how to survive, how to breathe, how to react and how to lead are small steps forward when sparring with a partner. Hard sparring takes this opportunity away from both fighters. Learning to establish a stance, to relax and to ease into just the mere image of a fighter being in front of you can be where a lot of fighters start off. There should be no egos during a sparring session, this is a great opportunity to develop as a fighter and to establish a comfortable style of Muay Thai moving forward.